You look ever so beautiful, Rosalind. Good luck with your new adventure in Oxford! The second photo is especially beautiful to me. What a wonderful and exciting time for you- congratulations on securing your place at Oxford! A very beautiful dress. The building reminds me of a little lodge my grandfather built for himself. Congratulations on the new adventure, and thank you for years of well-written, thoughtful & elegant posts - I hope there'll be many more. I've read your blog for a while now, but I don't think I've ever commented - but I think your writing is fantastic and I wish you the best of luck at Oxford. Can't believe it'll be me going off to university in two years! Going to oxford, that's an amazing adventure! But yes, it will be full of change! I think change is always good, but definitely hard! This outfit is perfect on you! So excited for the next chapter of you life--this is such a major one, and what I'm sure will be an amazing one. 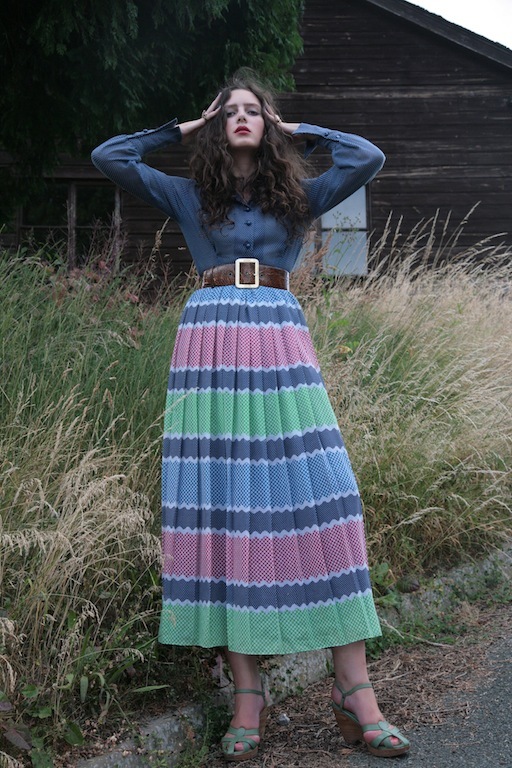 Also this skirt is perfection. I just stumbled onto your blog for the first time & am so in love! This wonderfully written post couldn't have come at a better time. Good luck with your new and exciting life change! Roz, can I just say how much I admire you? You're so incredibly beautiful and intelligent, and you've accomplished so much, so quickly. You're doing great things. That's a spectacular dress, very well chosen by your mum and styled brilliantly by you. I love the photos as well, particularly the first and third. The colours and mood of the first shot are superb with the combination of the stunning sky and the long gold grass. Also the way the light hits your face. Massive congratulations on getting in to Oxford, which college? Your adventure is about to commence, how exciting! It will be wonderful. 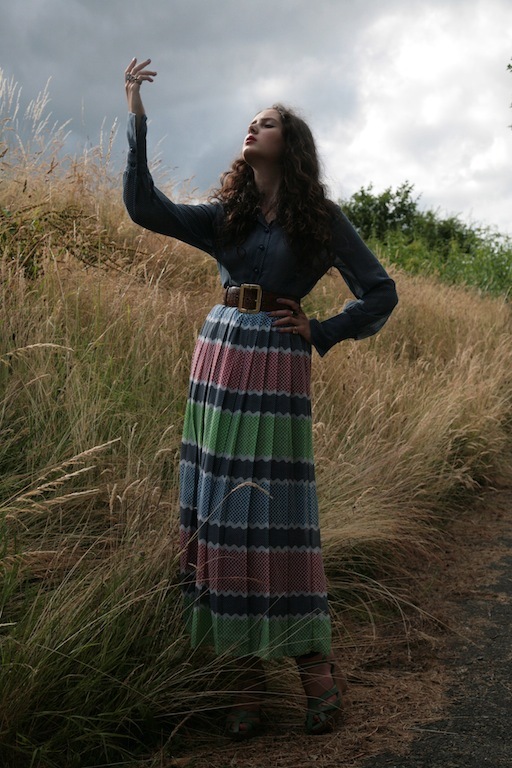 I know what you mean about the true Kate Bush-ness of this beautiful dress (well done Vix and your Mum), the hand gestures make it even more so. 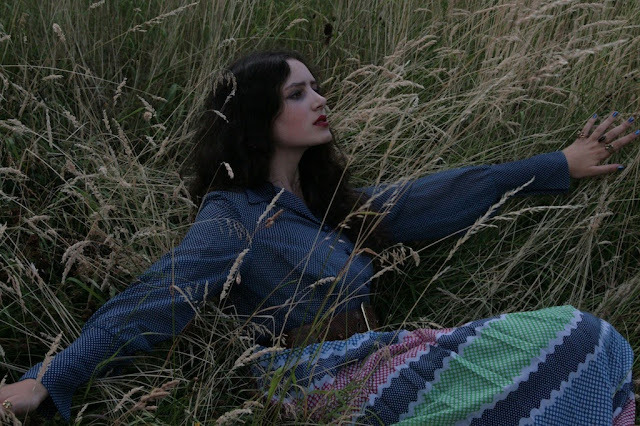 Very Wuthering Heights and oh so gorgeous! p.s. thanks for your comment about me looking like a teenager, it made my day, especially as I'm pushing 40! I loved the wistfulness of this piece, or was the wistfulness in the pictures, because I feel as if you eschewed wistfulness in the imagery of your prose. Multi-layered and precise thinking as always. I love your work. Good luck! I'm sure you're about to have the time of your life, and I'm excited to keep reading about your adventures. Thanks for taking the time to say hello on my blog. I wish you all the very best at Oxford, and feel somehow a sense of shared experience with me also being at the age of 18 and embarking on a changed environment, even though were just 2 amongst the thousands in the same situation. Will love to hear more about your time studying, I hope to start an English lit degree in 2014! I'm thrilled to see you wearing that dress, it looks even more gorgeous than I hoped. Your lovely Mum's got impeccable taste. Truly so excited for you and your new life at Oxford. I can't even imagine how walking through those hallowed halls must feel like. I've just had nieces dropped off at Ivy League colleges in the east, my brother and sister in-law wistful and teary-eyed. And I look back at how my parents must have felt saying good-bye at the airport gates when my sister and I were off to university in England. I was too excited to consider how my mother was putting on her bravest smile, so eager was I to jump into the airplane. (I can't believe I'm this far behind on commenting! )First off, demolition. New structures accommodate. Even young people can be less set in their ways. Just don't try and bulldoze me. Stalwart. But bending like a willow I hope I am. But I do get sad to see the old always replaced structurally. Here they bulldoze an old building and just keep the facade - this is considered preservation of a sort. As for your school adventures, my goodness, this is too exciting!! I shall live vicariously through you. Also, thank you for the mention. I am thrilled that your mum reads my blog - she is uber-cool and has the World's Best Hair.